Plus, how to get £12 BACK EVERY MONTH for premium web and email services! Every domain name hosted with Freeola and Get Dotted enjoys free domain hosting, with a ton of great benefits. You'll get a free, mobile-friendly One-Page Website - with free use of InstantPro Website Builder to design, build and host your homepage - as well as a free unlimited POP3 email with our One Address service. 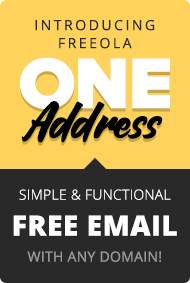 And with Freeola.com, we offer unlimited, high-quality email, webmail, web hosting and design tools for your domain. All for just a few pounds a month. A pick 'n' mix of email and web services (up to £12 per month) is provided absolutely free to customers with a Freeola Broadband connection and these are referred to across our sites as Freeola's Unlimited Free Services. Can't decide on a domain? Try our Domain Name Generator instead. with domain names from Get Dotted. Setup your own website quickly and easily with our Free InstantPro Homepage Builder. 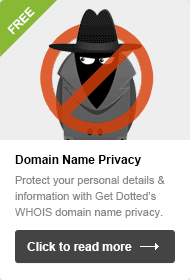 Keep your personal details private to reduce span and unwanted messages with WHOIS Privacy. Get full control over your domain with our comprehensive DNS settings and options. Create and edit unlimited subdomains with our easy to use control panel, MyFreeola. Setup unlimited autoresponders and email forwarding to organise your email communications. We'll give you a totally unlimited POP3 email mailbox for free with each domain name! Assign MX Records to your domain name to allow you to set which mail servers you want to use. 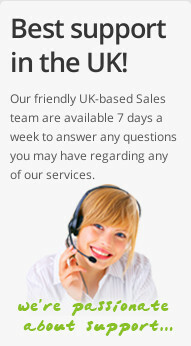 Help is always on hand from our UK-based Help and Technical Support team. Sell your domain names with Get Dotted totally free of charge! We don't even take a cut. If you need more email addresses, or synchronised IMAP email, try our premium email hosting platform with a free 3 month trial. Help your site in search engines and get free promotion for your website with our customer sites directory. "Earn up to 20% off renewal fees with Get Dotted!" Get up to 20% off domain renewals and domain privacy with GetDotted! Receive a 10% discount when you opt-in to renewal reminders by text message, and a further 10% when you choose to auto-renew. It's that easy! Powerful servers, unlimited allowances and low prices make these premium services the ideal upgrade for your domain. Anyone can make a website with InstantPro Website Builder. All domains come with a free InstantPro One-Page Website. Just £3.49 per month for unlimited pages (unlimited hosting included!)	. With EmailPro you get unlimited email addresses at your domain with optional IMAP synchronised email. Just £2 a month and only £1.30 for each extra domain name. Our VIP Web Hosting products provide you with your own unlimited web space so you can upload a website of absolutely any size from just £3.64 per month. Simply log in to your MyFreeola account where you'll be prompted to set up your domain name using our simple domain set up wizard. We'll guide you through a few easy steps to set up email, websites and any other optional settings for your domain name(s). If you already have a domain name with Get Dotted, or if you already have a MyFreeola account, you can log in here and begin your domain web hosting. You can register domain names with Get Dotted, or if you already have domain names hosted elsewhere, you can transfer your domain names to Get Dotted free of charge and take advantage of unlimited hosting from Freeola. See all web hosting options and all email hosting options.